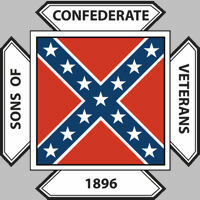 Help the Texas Division SCV to Preserve Historic Confederate Flags! The Texas Division of the SCV has pledged its efforts to support the conservation of historic flags like the banner shown below. 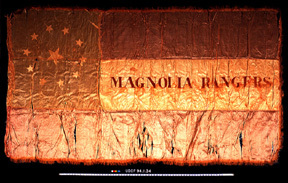 The Magnolia Ranger flag was made by the ladies of Cedar Bayou and Clear Creek (now League City) and presented by Miss Lucretia Coward in September 1861 to a Texas Militia Unit called the Magnolia Rangers. Many men of the unit later joined another famous regiment, Waul's Texas Legion. Of special note is that the obverse of the flag displayed the notation "Instituted Jan. 17, 1861", which is believed to be the formation date of the unit that flew it. The date precedes the secession of Texas by about six weeks. The flag was retained by Capt. George W. Durant and used at the funerals of the veterans of the Magnolia Rangers as they died after the war. The flag was passed on to his gr.gr.grandson, Ralph Cushman, who donated it to the United Daughters of the Confederacy with the stipulation that it belonged to the Citizens of Texas and the descendants of the Magnolia Rangers and after restoration it had to be displayed. The flag is currently held in trust by the Texas Division, United Daughters of the Confederacy. The flag has now been totally restored, with half of the approximate $16,000 cost paid by the SCV in 1999. The flag is now on display at the Museum of Southern History in Sugarland, Texas. 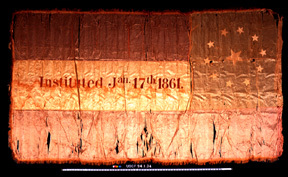 Below are photographs of the flag in its original condition. It is a silk flag approximately 4-1/2' by 8-3/4'. Silk flags are more susceptible to deterioration than flags made of other materials such as cotton.